Much of our Canadian military history is little known outside of the families that were involved… and, sadly, even those families are rapidly losing contact with the treasures their ancestors left them! Much of the detail of this story is mythical — the skeleton upon which it is built, however, is pure fact. Canada has much for which it should be proud. 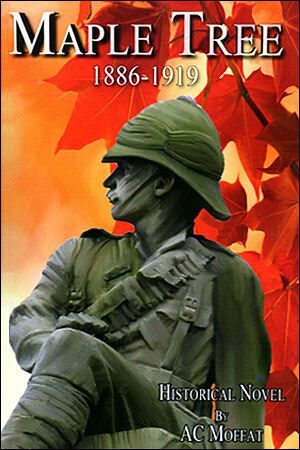 Although the greater part of our national history is based on hunting, trapping, exploring, and such; it was our Canadian soldiers who brought this Country out of the subservient role of minor child in the World’s greatest Empire and turned us into an independent Nation, honoured and respected worldwide. Canada — the only Country to have played a major role in settling World conflicts by the efforts of Volunteers! This is the tale of such people as have made Canada what it has become. People who voluntarily served Crown and Country no matter what the personal cost! We must all remember and honour them! Once settled into the Military Hospital in England, William felt a warm wave of relief sweep over him. He hadn’t appreciated how deeply the pressure in France had affected him. He could not begin to imagine how much more those who spent months — even years — in the trenches must be affected. Once again he realized how fortunate he had been when he looked about the Wards in the Hospital. He was not in the least ashamed that he periodically cried himself to sleep after a day in the sun room with soldiers who were now little more than vegetables!